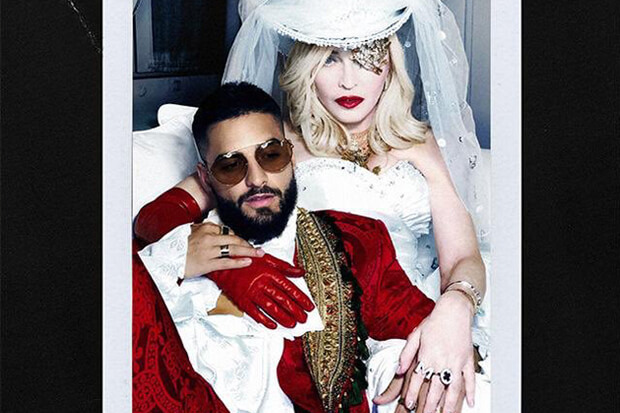 Madonna Links With Maluma For 'Madame X' Lead Single, "Medellin"
The Queen of Pop's 14th album is called 'Madame X' and it's going to be epic. That was quick! Yesterday (April 14), Madonna shook up our Sunday morning by announcing the imminent release of her highly anticipated new album Madame X. Sharing the news via a video teaser on her very iconic Instagram, the Queen Of Pop spilled all the tea. “I decided to call my record Madame X,” she said. “Madame X is a secret agent, traveling around the world, changing identities, fighting for freedom, bringing light to dark places.” And it looks like the LP is coming sooner rather than later. In fact, the first taste is arriving this week. Today, Madonna took to social media to announce the project’s lead single – “Medellin.” Not only that, but she confirmed that it featured vocals from Maluma. And it gets even better. “Medellin” arrives this Wednesday (April 17). The news about a collaboration between the two is hardly surprising. The “Champagne Rosé” icon shared a photo from inside the studio with the Colombian heartthrob earlier this year. “Cooking up some Fuego over here,” she teased. If you ask me, that’s a sign that we should expect a banger. On the bright side we don’t have to wait too long for confirmation. Check out the single cover and announcement below!